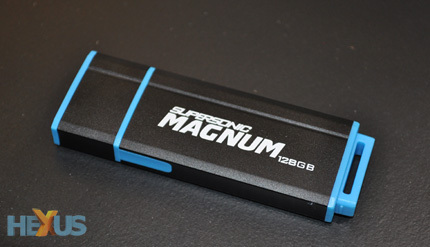 Patriot, at CeBIT, has just announced a USB 3.0 series of flash drives called the Supersonic Magnum available in storage space up to 128GB. Whats special about this flash drive is its unparalleled ability to reach 200MB/sec sequential read and 110MB/sec sequential write speeds through the use of an eight channel connector. Almost everyone in this day and age carries around a USB flash drive and with the advancement in technology the demands on storage space and transfer speeds has risen too. It was only a year ago when the fastest commercially available flash drive one could get would have done ~30MB/sec. With the advent of USB 3.0 things have changed though. Most hard drives top out at 100MB/sec so the thought of having something pocketable that does twice that is quite frankly mind blowing. Imagine transferring 50GB in 5 minutes. No information on price at the moment.